ORIGIN GLOBAL IS THE WORLD’S LEADING SPECIALIST MANUFACTURER OF ALUMINIUM BIFOLDING DOORS. Like all replacement window and door products, you usually get what you pay for. 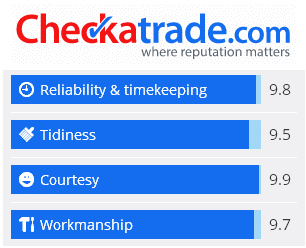 We only ever focus on quality at Harp, and whilst this won’t always make us the cheapest installer it means our customers know that they are getting real peace of mind when we install their new windows and doors. There are many bifolding doors out on the market and we wanted one that excelled not only in performance and quality but good looks too. Enter Origin Global! Rear elevation of a recent installation at Shire Lane, Chorleywood (try and ignore the ongoing building work!). 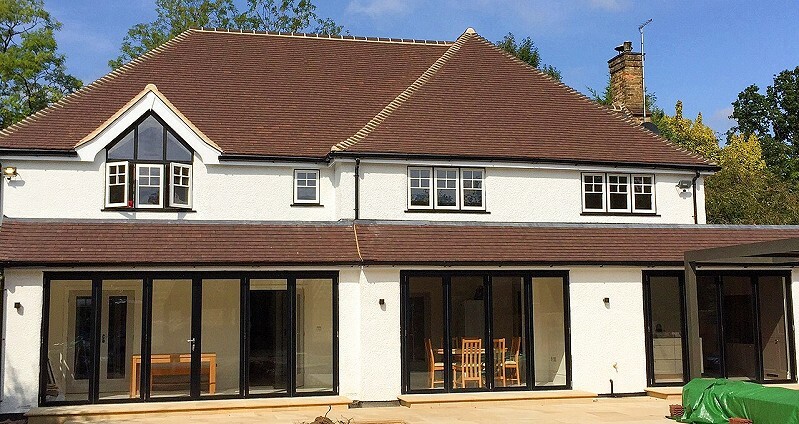 3 sets of dual colour Origin aluminium bifolding doors with black exterior, white interior. 1 x 6-panel door and 2 x 4-panel doors will open up the ground floor completely and provide full access to the new terrace. Exclusively designed and manufactured at Origin’s impressive Buckinghamshire based factory, each and every bifold door is tailored to your specific requirements. Recognised as setting the benchmark in both design and technology, our Origin bifold doors are used the world over in all climates and weather. It’s no surprise that they not only meet but exceed the Building Regulations for thermal efficiency! They also offer the advantage of a flush track, giving you an unobstructed walkway and the feel of open plan. With a gentle push, you can create a new living space which seamlessly joins your outdoor and indoor living areas to make the most of the space and the view. This smooth transition is courtesy of the unique free-glide roller system which makes sliding the doors open and closed effortless. 1 x 5-panel dual colour door and 1 x 5-panel dual colour moving corner post door allows the inside and outside to merge seamlessly. Ah well … we can all dream! Origin bifolds come in configurations ranging from two to eight door sets. AND, you can even have corner options too. Just like a conventional set of bi-folds, the corner option is available in lots of different opening, folding and sliding configurations. The corner set is also able to be supplied with or without fixed posts for a truly uninterrupted panoramic view. You could be guilty of starting a major attack of door envy here! The beauty of Origin doors is that they work in all types of home, from modest to spectacular! They are the perfect replacement solution to that rather old and shabby looking sliding patio door in the back room. And, depending on the configuration you have, the lead door can also work as a regular traffic door when you don’t want to open the doors out fully. Tring, Herts. 1 x 4-panel bifold door with demi-lune window above in a grey finish. This is a much more modest use of our doors and shows off their versatility perfectly. All the colours of the rainbow … and more! Whether you prefer a contemporary or traditional finish, the endless colour options available from Origin allow you to make a statement with a bold colour or simply match the surroundings of your home. Choose from the range of standard colours, or over 150 RAL colours – there are even woodgrain effects! No matter how discerning your tastes, there will be something to satisfy every style and complement every home. You can even choose to have doors with different colours inside and outside your home, giving you almost limitless options. We’ve installed many dual colour bifold doors and it’s a popular choice with our customers. A fantastic installation in Bucks Hill, Herts. 3 sets of dual coloured bifold doors, 2 x 3-panel doors (to the sides) and 1 x 4-panel door to the rear. Dark anthracite externally and white internally. 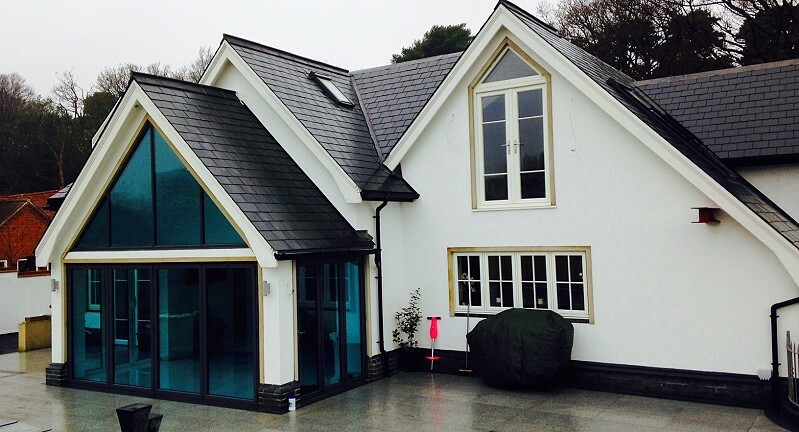 Glazed in Reflex solar control smart glass – looks blue on the outside but looks perfectly normal from the inside! Cool! Colour co-ordinated seals in 7 different colours! Finger-safe gasket technology protects small fingers! OK, but why not uPVC? Wouldn’t that be a more cost effective option? Yes it would without a doubt, but you have to consider more than just the cost. 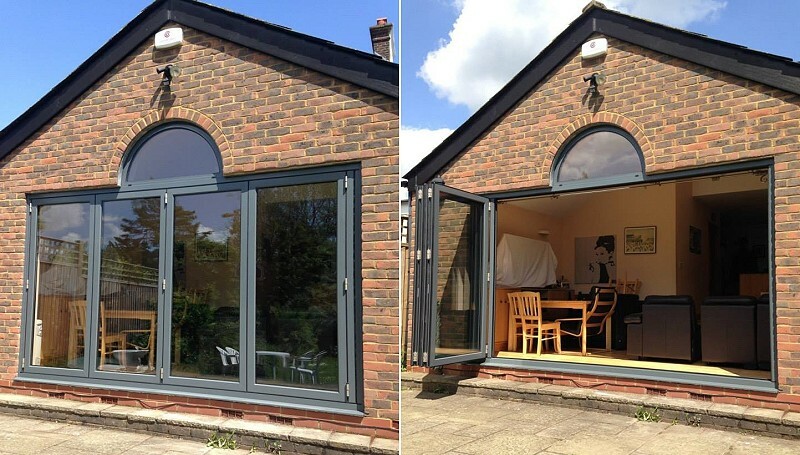 We don’t install uPVC bifolds because we don’t feel that there is currently a product available that we would feel happy guaranteeing for 10 years. There can often be post-installation issues with uPVC because they are not a strong as aluminium and for this reason we won’t fit them. Our guarantee is an important part of the overall package that we offer our customers – this is why we will only install products that we feel can live up to our guarantee. You get 100% peace of mind with Harp. Always. 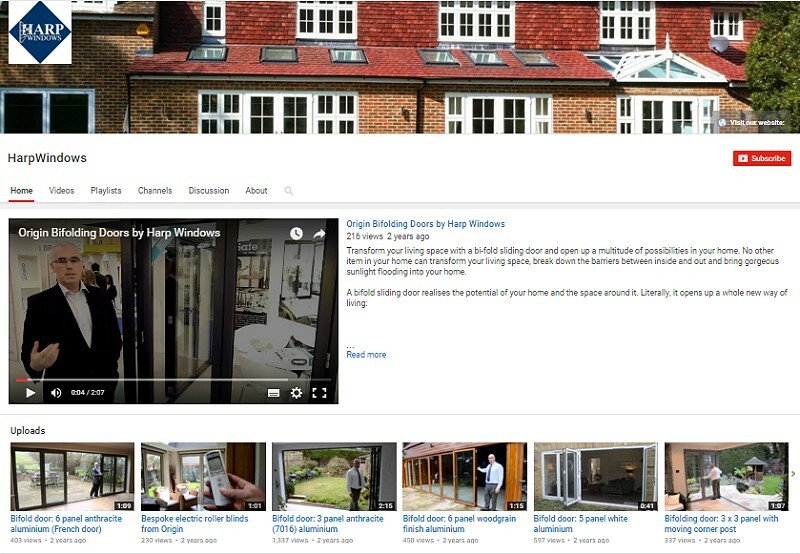 CHECK OUT ALL OUR BROCHURES & VIDEOS OF ORIGIN BIFOLD DOORS! See for yourself why these doors are so highly rated! There’s a couple of PDF brochures and a pretty good video on our Brochures and Videos page but you can view the whole range (includes corner options) on our YouTube page. Happy viewing! 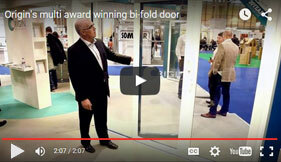 Check out our YouTube page and view all seven bifold door videos!